Raggiungi l'aeroporto di Chiang Mai dal tuo hotel in posizione centrale a Chiang Mai in tempo e senza problemi con questo trasferimento partenze condiviso. Il servizio è disponibile 24/7. pick up on time and quit trip. The service by this company has been consistently fantastic, on time, with friendly drivers who have lots of tips for tours, restaurants, places to shop. I highly recommend using it! Even though my flight was changed, the transfer was there, and very courteous and helpful. I've used Viator for Airport transfers several times now and am never disappointed! It's nice that a company rep escorts you from the hotel lobby to the car/van with a driver and takes you into the airport - right through the correct security lines and points you right to your check in line...basically holding your hand which is sometimes nice when you are in foreign country unfamiliar with the language/airport etc.. Also they arrived early and were waiting in the lobby for me which is great. Excellent. On time and waiting for us. We booked a shared transfer but got a Private van for us both. The tour guide was very friendly and helpful. She helped us with the Hotel checkin and made some other recommendations. Both drivers who were picking up and dropping us at Chiang Mai Airport punctually were quite courteous towards us. Before departing to my home country, someone (one of their drivers' assistant) was asking rudely for money without showing his licence card. Therefore, we doubted about his licence but I presented a viator voucher to him, showing that it was already pre-paid. Hope every driver should possess their licences to show them to the tourists and also cultivate their courteous attitudes towards them in future. I was very happy with the transfer. I had booked my flight for 7am and needed a pick up from my guesthouse in Chiang Mai at 5.45 am.A driver arrived at 5.30 am, helped me with my bags at the airport. 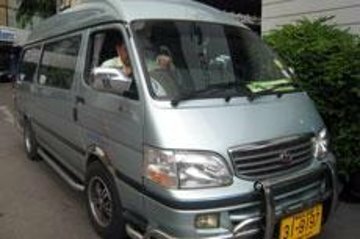 I would highly recommend this service to anyone who needs a transport from or to the Chiang Mai airport. Service is 24/7. Exemplary service. Both guide and driver are to be commended.